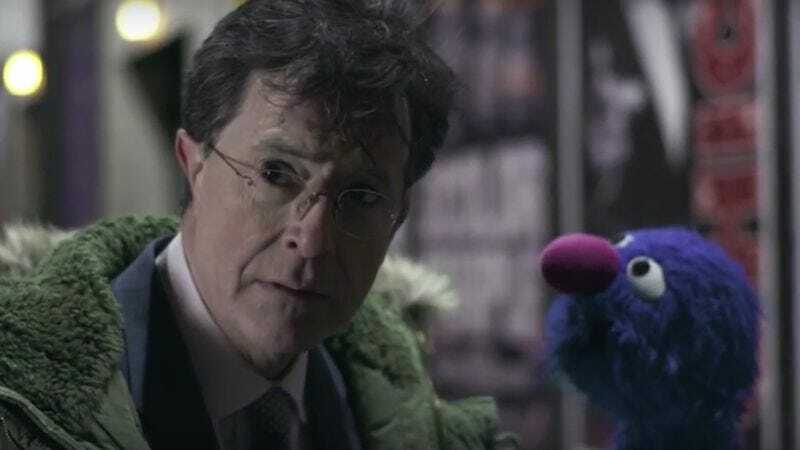 Monday night’s episode of The Late Show opened with a new (albeit temporary) credits sequence, in the form of a Spike Jonze short film starring Stephen Colbert and Sesame Street’s Grover. In place of the bird’s-eye view of New York City that the talk show’s intro usually provides, we see Colbert wake up in Central Park and make his way around the city, to an adagio version of “Humanism.” Colbert’s adopted home has turned into a cold place where adults ignore him and children laugh at him, and his only friend is the Muppet, Grover. It’s a brief friendship, but one that shores up Colbert’s confidence in humanity and his ability to lead the Late Show—and Grover doesn’t even have to switch to his superhero alter-ego to help. The short probably won’t permanently replace the intro—which recently joined the new credits canon—but its three-minute runtime really packs an emotional punch.